Milon's Secret Castle (known in Japan as Meikyou Kumikyoku Milon no Daibouken, literally "The Maze Suite: Milon's Great Adventure") is an action-adventure game released by Hudson Soft for the Famicom in 1986. It was later released for the NES in 1988. In this game, the main character Milon fights by shooting bubbles. The player starts out at the bottom floor of a four-story castle, named Castle Garland. Each story can only be reached by defeating the boss of the floor below. Although seemingly basic, the only way the bosses can even be reached is by discovering a host of secrets, some of which require sheer luck or a helpful manual. Each room of the castle contains secrets similar to those of the Super Mario Bros. series; the secrets are uncovered by shooting bubbles into invisible trigger objects. The game has generally been considered extremely difficult and frustrating. There are no save points, and once a player runs out of life, the game is over, however, it is possible to continue after obtaining the first crystal. Unlike in most platform games of the era, Milon doesn't "blink" to become briefly invincible when he is attacked by an enemy, which means his energy can be sapped in no time if he doesn't move away. 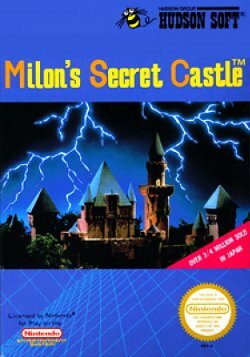 Milon's Secret Castle was reprogrammed for play on the Game Boy. While it kept the same title in the US, the name was changed in Japan to Milon no Meikyou Kumikyoku (ミロンの迷宮組曲). The NES version was released in 2005 as part of a compilation on the Game Boy Advance known as Hudson Best Collection Vol. 3. The game was ported to mobile phones and the Hudson Channel for the PS2 exclusively in Japan with redone graphics and gameplay for a limited amount of time. The same version was released on the Wii Virtual Console service in North America on June 4, 2007 for 500 Wii Points. Milon lives in the land of Hudson where people use music to communicate with each other. However, Milon does not have the ability to communicate. He always asked himself why he is the only one who lacks the ability to understand people and music. One day he decides to travel throughout the land of Hudson to search for other people like himself. Before leaving for his trip, Milon decides to visit Queen Eliza who lives in Hudson's Secret Castle. When Milon arrives at the Secret Castle, the people were being attacked by the Evil Warlord from the north region. The warlord robs the people of all their musical instruments and occupies the Secret Castle. Queen Eliza is held captive deep inside the Secret Castle by the Warlord and his demon-monsters. Milon volunteers to fight the Evil Warlord and his demons and to rescue Queen Eliza and the musical instruments for the people of Hudson. This will not be an easy task. The Secret Castle has many different rooms and each room is a maze filled with demons, secret passages and doors. However, the Castle's Magician tells Milon that Queen Eliza has hidden many tools, instruments and money to help him. The Magician also gives Milon a magic "Bubble" to assist him in finding the places where the helpful items are hidden and where they may be bought. Your mission is to help Milon solve the mysteries of the Secret Castle, destroy the Evil Warlord and his demon-monsters, rescue Queen Eliza and the musical instruments for the people of Hudson. Enter the Castle and solve the puzzle of each maze-room. Find and save the hidden money and 12 helpful items. Destroy each of the seven demon-monsters lurking in the Castle and collect seven crystal balls. The crystal ball is your key to advance to the next level of the Castle. After completing everything above, you must find two secret items to save Queen Eliza. Those two items are for you to find....! The Game Boy version of the game includes a password feature, but is otherwise mostly identical to the original version. The following is a list of some of the more obvious differences. The room sizes are smaller, likely due in part to the smaller available screen size. As a result, many hidden items and platforms are not in the same absolute position, but can be found in roughly the same relative position. Every item costs a little less money than in the NES version. Additionally, there are slightly fewer money tiles to collect, but in general, this works largely in favor of the player. The store that gives you $10 in the NES version gives you $15 in this version. Boss fights are substantially easier. You can attack the entire body of the boss, not just the head. Bosses send only one projectile out at a time, and the projectiles are much smaller. The projectiles are more focused on your current position, so they are easier to dodge. The ending has new illustrations added to it. This page has been accessed 52,502 times.